This show was broadcast on July 27, 2015. 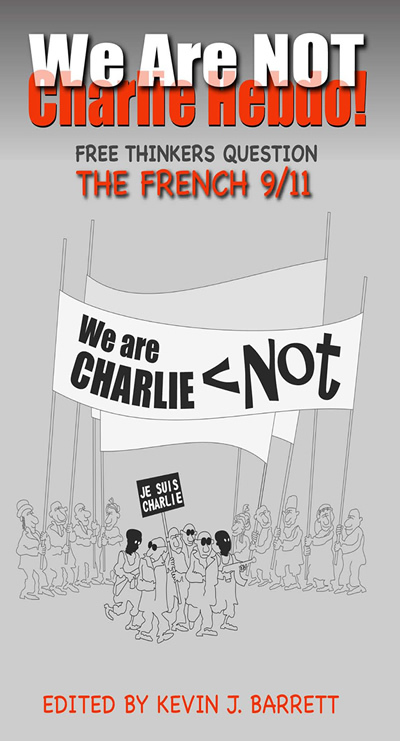 Kevin Barrett discusses his new anthology, “We Are Not Charlie Hebdo: Free Thinkers Question the French 9/11” that includes twenty-two different authors’ political analysis of the shooting attack on the Paris satirical magazine, Charlie Hebdo, of January 7, 2015. Produced by Bonnie Faulkner, Tony Rango and Yarrow Mahko. This entry was posted on Sunday, July 26th, 2015 at 9:57 pm	and is filed under 9/11, Censorship-Propaganda, False Flag/Fake Terror, Freedom, Guns & Butter, Justice, Kevin Barrett, News, Protest, War Crimes. You can follow any responses to this entry through the RSS 2.0 feed.